Built during the 1820s, the row of houses on the 300 block of Saint Paul Place (1820s Houses) was erected in the aftermath of the War of 1812 and constituted some of the oldest buildings in Baltimore. This row was the last row of its type downtown. By 1890, the houses played a central role in Baltimore’s African American community as the location of the school for the St. Francis Xavier Church, the first Catholic Church for African Americans in the country. 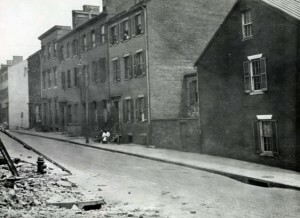 In the early 1900s, the row had both black and white residents at a time when mixed-race blocks were illegal in Baltimore. Mercy Hospital demolished the buildings in 2007 to construct a new building on the site. Image courtesy Enoch Pratt Free Library. The rowhouses in the 300 block of Saint Paul Place were not only significant for their age but also the role they played in the city’s African American history. Built in the 1820s, during the aftermath of the War of 1812, this row reflected Baltimore’s emergence as one of the largest and fastest growing cities in the country. They are the last block of these early houses remaining downtown from the era when Baltimore was growing up, and are some of the earliest buildings remaining in the city. The other houses that were built in this period were destroyed during the Great Fire of 1904, during urban renewal projects in the 1920s and 1970s, and individually for other reasons. The buildings at 300 St. Paul Place are the last remaining row downtown from this early period in Baltimore’s history. By 1890, the houses played a central role in Baltimore’s African American community as the location of the Male Colored School Number 1. This school moved from the Peale Museum to 345 Courtland Street, now 345 St. Paul Street (the northern most house in the row). The Male Colored School Number 1 was the first to grant degrees in higher education to African Americans in Baltimore. Later in the 1890s, the building became the school building for the St. Francis Xavier Church, the first Catholic Church for African Americans in the country. Other notable African American institutions were also located in the area, including Bethel Church, Bowie State University, and the Baltimore Manual Training School that went on to become the Baltimore Polytechnic Institute. By the early 1900s, the row contained a mixture of white and black residents at a time when the city outlawed different races living in the same block. Some of the residents were born as enslaved people, including Ms. Emeline Torney who was born in St. Mary’s County and was a cook at the St. Francis Xavier School. Other blocks in the area, including the row of houses that stood on the other side of St. Paul Street, were demolished during this era, likely as part of the city’s racial segregation policies. Despite clearances elsewhere, the houses in the 300 block survived during the time as a mixed-race row. Today it is an important reminder of the stalwart residences who defied their city in living in a mixed-race block.